Built probably in the second century B.C., this is the most recent gate. It was built out of limestone from Sarno and was successively repaired with uncertain works. The minor portal was reserved for pedestrians while the other one was for vehicles. The steep slope and the absence of the characteristic tracks left by carts in the pavement would lead to the supposition that goods were transported mainly by mules on this side. To the left, towards the south, there was once a tower, that was successively incorporated into the structures of the Imperial Villa. 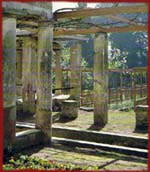 The Imperial Villa was built at the end of the first century B.C. in the area beneath the terrace of the Temple of Venus and against the city walls near the Marina Gate. In front of the villa there was a ninety-meter long portico and the house had the largest (6 x 7.5 x 8 m.) and most sumptuous reception room in Pompeii. It was abandoned after the earthquake of 62 A.D..
Reconstructed and rearranged in 1948, on the ruins of the old museum destroyed by the bombardments of 1943, it presents the historical development of Pompeii. There is a pre-Samnite section, that picks up the most ancient material of Oscan civilization of the Sarno Valley. Other sections are devoted to the Pompeian iconografy and to the Roman-Pompeii, with finds that illustrate the economic and merchant city-life, tools for work, materials from some workshops and surgical instruments. Venus is the patron goddess of Pompeii and her sanctuary, from where one can enjoy a view of the Gulf of Naples, dominates the plain below. The earthquake of 62 A.D. destroyed the edifice and its reconstruction was still in process when the eruption occurred. The area was surrounded by arcades. Still existing in the middle of the temple is its podium (29,15 x 15,5 m.). The large vestibule (chalcidicum) is probably where public notices were posted. The inside is made up of an enormous covered square whose roof is held up by 28lateral columns which are at least 11 meters high. This justifies its interpretation as a covered Forum. The wall decorations were made up of large slabs of stucco painted so as to imitate large blocks of polychromatic marble. At the end of the interior is the imposing yet austere façade of the tribunal, or rather where judges administered justice, raised on a two meter high podium. Thus the building had the double function of covered Forum and court of justice. The municipal buildings are on the southern side of the Forum. The function of each room is unknown. It is assumed that the Curia, or the place where the decurions which made up the Senate met, was at the center. The seat of the duumviri (the two mayors holding the jurisdictional power) and the seat of the ædiles (chairmen responsible for running the city) were along the sides. The central courtyard was an open place. Electors came in from the side of the Forum and proceeded towards the podium to the south, on the right side of the entrance, where the magistrates sat. These were in charge of the polling station and verified whether the voters had the right to vote. After the verification the voters went out into Via dell'Abbondanza where the ballot-box was located. Voters had to elect the municipal chairmen (ædiles) and the mayors (duóviri iúre dicundo); the latter would then elect the members of the town-council (decuriones). It was built in the VI century B.C., when Pompeii, even though it wasn’t a Greek polis, was submitted to the maritime hegemony and the influence of Cumæ and Neápolis. In fact, the foundations of the area of the temple underline important rests of the architectonic terracotta decoration of the upper parts of the building. To the cult of Hercules, which was devoted the temple, it was also associated the one of Minerva. The base measures 28 x 21 m., and the traces of varied remaking suffered in the Samnite period are clearly showed; it became, in Roman period, a “sacello”. In the temple there was an exedra with sun-dial, put by the same mayors that erected the one in the Temple of Apollo. The big square with the porticos behind the stage of the theater was originally used as a foyer for the public during the breaks of the shows. The general lack of buildings due to the earthquake of 62 A.D. caused it to be transformed into a gymnasium and hotel for the gladiators and their families. That's why it is called Gladiators' Barracks. The body of a fettered slave and that of a bejewelled matron gone to see a young gladiator were found during the excavation. The Odéion is a small covered theater used for music concerts and poetry recitals; it held a restricted and refined audience of approximately 1,300 people. It was built after the foundation of the colony in 80 B.C., by order of the mayors Gaius Quintius Valgus and Marcus Porcius, who also had the Amphitheater built. The building is a semicircular structure inscribed in a square that sustained the roof with four slopes. It was divided into two orders of seats, divided by a backrest. The first five rows have wider steps and were reserved for the seats (bisellia) of distinguished personalites. The parapets are characterized at their extremities by two suggestive kneeling giants (Telamons) which hold up corbels, an aesthetic solution that is also found in the Forum Baths. The orchestra was paved in marble. The Theater could hold 5,000 spectators. Built in the Samnite period during the second century B.C., it underwent several reconstructions. Its current shape essentially dates back to the restoration carried out in the Augustan period by the architect Marcus Artorius Primus thanks to the munificence of Marcus Holconius Rufus and Marcus Holconius Celer, according to the inscriptions. The construction on a hill-slope is typical of Greek architecture. The seats of the ordinary spectators were located inside the cávea, the wider seats at the bottom had comfortable chairs (bisellia) were for important people, while the two lateral boxes (tribunalia) over the entrances of the orchestra (vomitoria) were reserved for very important people. The background of the stage consisted of an architectonic façade with three doors imitating a building. Originally the chorus danced and sang in the orchestra. Inside, under the curved frame of the building there are blocks with holes; here is where the poles holding the curtain (velárium) used to be inserted. The curtain was operated with ropes and pulleys. Tragedies (Euripides, Seneca, Livy Andronicus, etc. ), comedies (Menander, Plautus, etc. ), farces (atellane) and pantomimes were performed at the theater. During the break the public used to meet inside the broad square portico behind the stage, which was called the Gladiators' Barracks, because it was used as such during the last years of the city. This gymnasium is called Samnite because it was built at least in the second century B.C., or during the Samnite period. It consists of a small rectangular courtyard surrounded by a peristyle. The fourth side was removed due to the extension of the Temple of Isis after the earthquake of 62 A.D.. The base against a column on the southern side supported a Roman copy in marble of Doriforos (lance carrier), a famous masterpiece of the Greek sculptor Polikletos. The steps behind the base witness the young athletes' custom to climb up to the statue and place their crowns on its head. The statue is exhibited at the National Archaeological Museum of Naples. The Temple of Isis consists of a cell on a high podium with a staircase on its front. In front of it there is a sacrificial altar. On the side of the altar there is a temple-shaped entrance which leads to a reservoir that used to contain the sacred water of the Nile. A large hall behind the temple was used as meeting-room by the initiates. The sanctuary was damaged by the earthquake of 62 A.D. and restored by Popidius Celsinus Ampliatus, who in return obtained the title of decurion for his six-years-old child Numerius. Carried out in the eighteenth century, the site was one of the first to be excavated. Visited even by Mozart when he was only 14, it inspired him to compose the "Magic Flute". The small temple is located along the Via di Stabia. It was identified thanks to an Oscan inscription found at the Stabia Gate. The god is known as Zeus Melichios, “as sweet as honey” or “benevolent”. The cult, of Greek type and present in Sicily, dates back to the period when Pompeii was culturally part of Magna Græcia. The little sanctuary consists of a portico at the bottom of which there is a cell placed on a high Italic-type podium with a staircase. In the front there is a big tufa altar. The cell has four Corinthian columns on its front. The terracotta statues of Jupiterand Juno with a bust of Minerva were found there. So it is probable that the cult of the Capitoline Triad had temporarily been transferred here, until the completion of the restoration of the Temple of Jupiter in the Forum damaged by the earthquake of 62 A.D.. Today instead the sanctuary is identified as the Temple of Asclepius and Hygeia, so the Temple of Zeus Melichios is to be sought beyond the Stabia Gate at the outskirts of the city. A temple devoted to a female divinity, of the III century B.C., has come to light during the last excavations in the south western front in Pompeii. The temple, with porticos and cisterns, is an unexpected religious building of Sumnite age and reveals a Pompeian society pre-Roman corresponding not to a small village but to a real city. In the temple, hypothesizes to be devoted to the ancient Mefite, Sumnite version of Venus, has been recovered votive material. In this house the marble impluvium and a beautiful portrait of the owner are notable (then transported in the Antiquarium). Behind the tablinium it is present also the peristyle with a fountain and two puteals. The Via dell'Abbondanza is Pompeii's lower Decumanus. Its name derives from a bas-relief that decorates a fountain located in the initial section close to the Forum. This long street connects the main points of the city located between the Forum and the Sarno Gate: the Forum itself, the Stabian Baths, the Theaters, the Temple of Isis and the Amphitheater. The street is the deliberate result of the city's urbanistic rationalization. Unearthed only at the beginning of this century, it is still rich with decorations, so that it represents for visitors the most suggestive trip in the ruins. Along this street we find many of the most beautiful houses, some having two-stories, where the rich Pompeian merchant middle-class lived: the House of the Cryptoportico, the House of Paquius Proculus, the House of the Chaste Lovers, the House of Gaius Julius Polybius, the House of Loreius Tiburtinus, the House of Venus in the Shell and the House of Julia Felix. It starts at Marina Gate and immediately leads to the Temple of Venus, the protector goddess of the city, followed by the Temple of Apollo, with a 48 columns portico and the copies of the bronze statues of Apollo and Diana (the original ones is preserved at the National Archaeological Museum of Naples). In front of the Temple of Apollo there is the Basilica, destined to the administration of justice and the business. The street finishes in the Forum. It leads to the area occupied by the Triangular Forum, so-called for its shape and limited by a complex of public buildings of the Hellenistic period: Large Theater, that can contain up to 5000 spectators and used for the representation of comedies and tragedies; Small Theater, with a capacity of 1000 spectators and turned to musical auditions; Samnite Palæstra, where the competitions of the noble and wealthy youth in Pompeii took place. On it there is the Temple of Isis, with pictorial decorations, sculptures and holy furnishings recovered in a good state of preservation; the temple is, in fact, one of the Isiac sanctuaries best preserved of the ancient world.